Every big day on one hand and Valentine’s Day on the other; it is celebrated like any other Indian festival that begins a week prior and then culminates to the enthralling main day. Clearly, when we speak about it, all we visualise are red roses and hearts. Well, the entire ambience is imbibed in romance, so why shouldn’t we be as well? 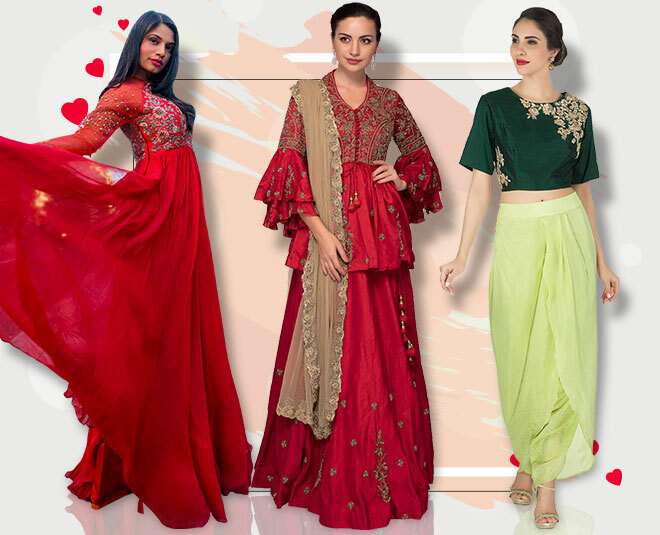 Starting from your outfit, here are some options and combinations dolled out by Nishit Gupta, Director at KALKI, that will surely make your day more exciting than ever before. Not just sensuous but extremely comfortable, perhaps this is what we call ‘Dress to Kill’. The colour will for sure slay many hearts and you shall exude happiness and confidence that will make heads turn. Sharp and subtle is something this ensemble stands for. The edgy silhouette and the perfect amount of redness will look fabulous. And when paired with a dark green clutch and black ankle boots, it is a lethal combo. For all the newlywed brides, it’s not necessary that you have to be too striking when the simplistic look hits equally hard. The uber-chic red frill and the delicate look is all set to enhance your charm and confidence as well. Who remembers Kareena Kapoor's style from 'Kabhi Khushi Kabhi Gham'? It has again come back in fashion and this time with some beautiful embroidery and colour, which will definitely attract the right kind of eyeballs. Needless to say that it is a classic colour that doesn’t only flatter any skin shade but it also enhances the right parts of your body. If you are unable to bring yourself to wear red, black is a forever option. If you love ruffles then this is your outfit. This saree sure is different, is red in colour and has ruffles for that unusual touch. This look is an exemplar for editing at its best, as this white ethereal ensemble looks beautiful and classy with the contrast embroidery over it, and will be a great addition to even your regular day wardrobe. It is something that we call ‘Your salvation’, as it has very impactful visibility and the modern-girly silhouette in this attire will make you feel enthusiastic and jovial. Are you ready to go on a fancy date or a themed party in this beautiful jump-suit? The attire is notorious and perfect for flirting around with your personality and bae as well. Why does only red gets to be the color of love? Try this embellished Green crop top and dhoti pants for a complete new makeover of love that will surely turn every head out there. Now get down to shopping As Soon As Possible and let us know what you wore on our Facebook Official account.